Twenty years ago, a man named Earl was sitting alone in a mobile home, the oven door open, two propane tanks set on either side, when the phone rang. He wasn’t expecting the call, it just sort of came out of the blue as he readied to turn on the gas. It was an acquaintance checking in to see how he was. It had been a tumultuous time. Forced to finally leave his wife and admit that he was the victim of female-perpetrated domestic violence was not an easy thing to do. 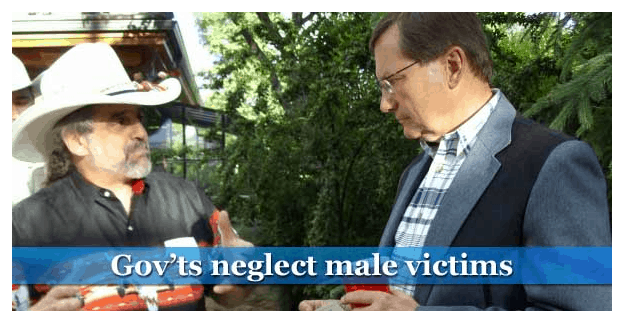 Not only was the issue not talked about, there were no support services to help men like Earl Silverman. He became a pariah, openly mocked and laughed at when he tried to explain his situation. Earl didn’t kill himself that day, but 20 years later, not a lot has changed. “I’m still trying to find some services to help me deal with this experience and I can’t,” he says. “There’s nowhere I could go to talk about it. There’s an effort to ensure that the voice of male victims of domestic violence is not heard.